Detention figures are provided by the Israeli Prison Service (IPS) on a monthly basis upon payment of a fee. The above figures relate only to individuals classified by the IPS as "security prisoners". An additional number of Palestinians from the West Bank, East Jerusalem and Gaza are held in IPS detention as "criminal prisoners". Criminal offences include entering Israel without a permit, frequently in the search for work. The approximate number of Palestinians held as "criminal prisoners" amounts to an additional 40 percent (adults) and 15 percent (children) on top of the numbers held as "security prisoners". The figures represent a snapshot count at the end of each month and are not cumulative. The IPS does not release figures of the total number of Palestinian children detained in any one year. It is estimated that between 500 and 700 children are held in Israeli military detention each year. A small number of children are held by the Israeli army and police for short periods following arrest. These children do not appear in the IPS figures but at any given time do not generally exceed 5 children. 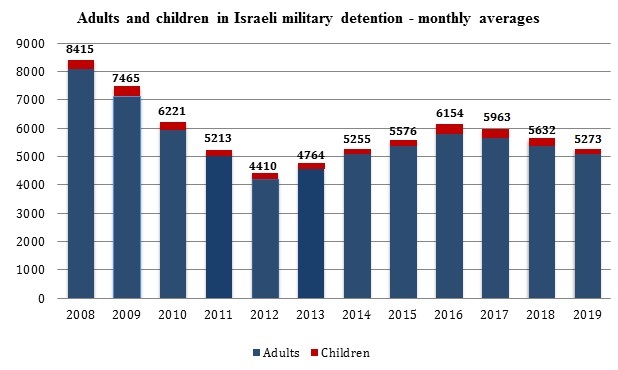 The monthly trend is based on a comparison between the number of children currently in detention and the number held in the preceding month. 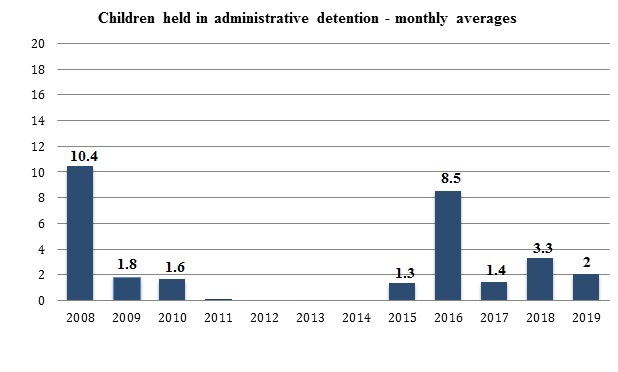 The annual trend is based on a comparison between the monthly average number of children held in detention during the current year and the average number held in the preceding year.